Our station wagon came to a rattling stop alongside a curb in Welsh, Louisiana. My cousin Wesley and I stepped out into the humid August air squinting and slightly confused. Our clothes were mismatched and awkward. Our skin was coated in a sticky cocktail of sweat, sunscreen, sand, DEET and dead mosquito parts (the end result of a failed attempt to sleep on a beach without a tent). We were a sight to behold. But in all fairness, we were in perfect complement with our vehicle. 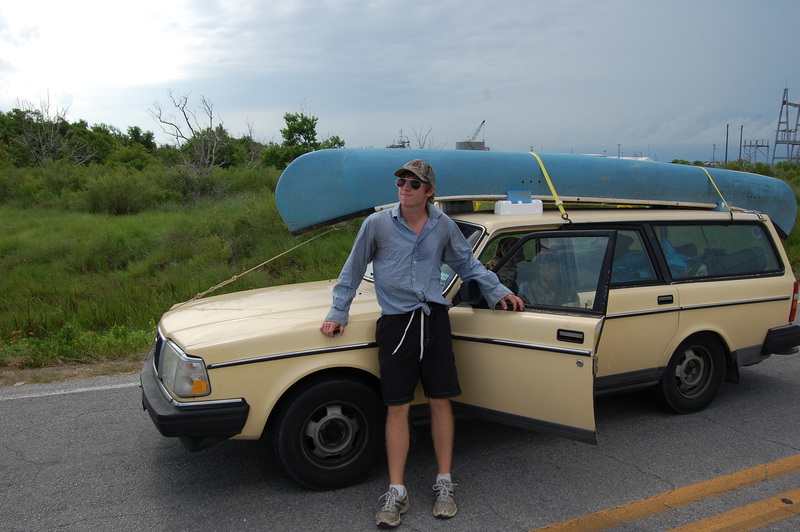 Wesley’s 1987 dijon mustard-colored Volvo station wagon, which barely clung to life, was our primary mode of transportation. A baby blue fiberglass canoe dating back to the late 1950’s, which was tied to the roof, was our second. 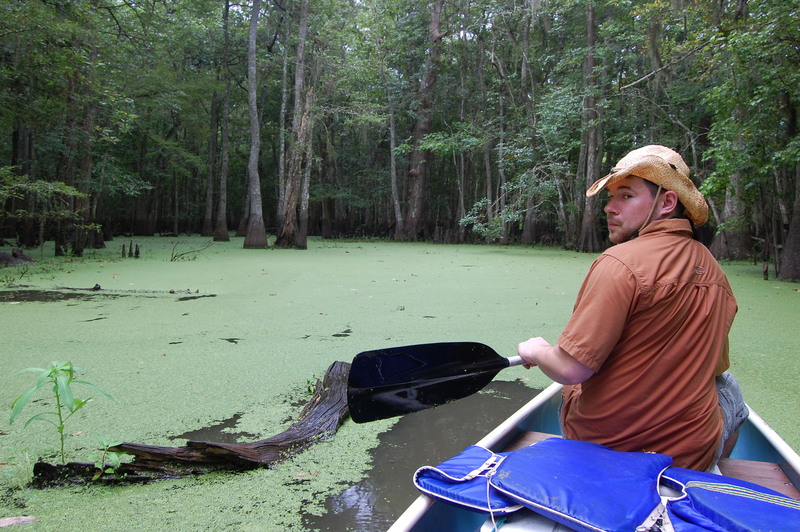 We had come to this part of Southwest Louisiana for one reason – to attempt an overnight canoe trip in a remote backwater bayou. We had the name of a particular bayou and instructions to inquire further at the Welsh City Hall, the building standing before us. We hesitated outside for a moment, knowing we were in no shape to go inside any government office. I was half expecting to get shooed out the door and kept at bay with a garden hose until the sheriff arrived. 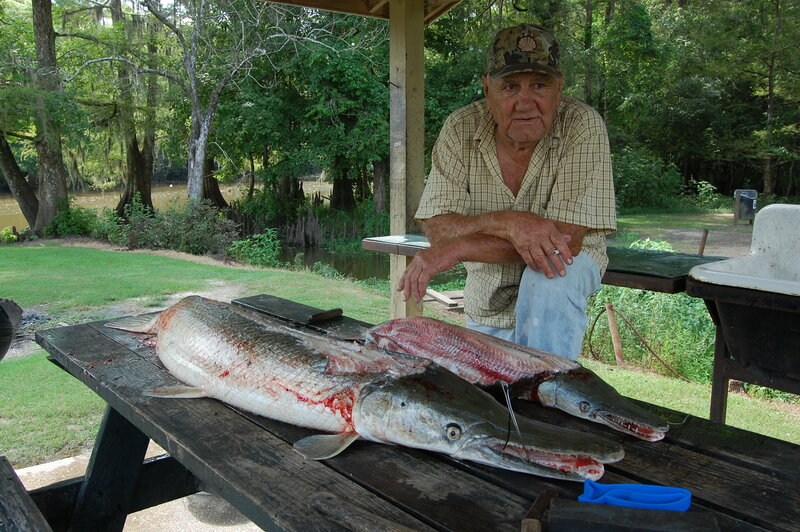 Instead, we were greeted with smiles, Cajun accents and directions to a place called Lacassine bayou. We thanked them, and upon their suggestion, ate lunch at an excellent establishment called Cajun Tales Seafood. The meal and service left us in high spirits, until we exited the restaurant to a tumultuous downpour. Inclement weather isn’t the most ideal time to begin an overnight canoe voyage in an unfamiliar swamp. But then again, I’m not sure there’s a right time to begin an overnight canoe voyage in an unfamiliar swamp. It didn’t matter; we were determined to canoe – rain, shine or violent lightning storm. 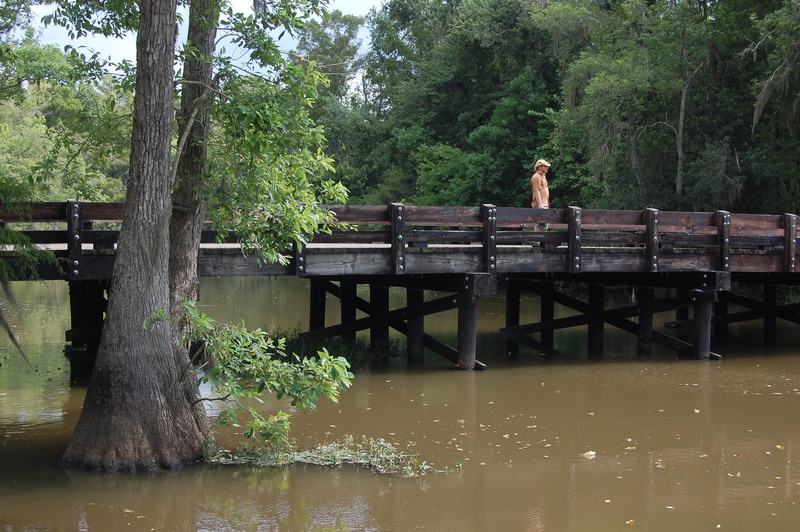 For the moment, we drove out of the storm and followed the directions to a place called Lorrain Bridge*, where stout pillars supported the low wooden structure across the mid-sized Lacassine Bayou. Bald Cypress trees draped in Spanish moss lined its edges. 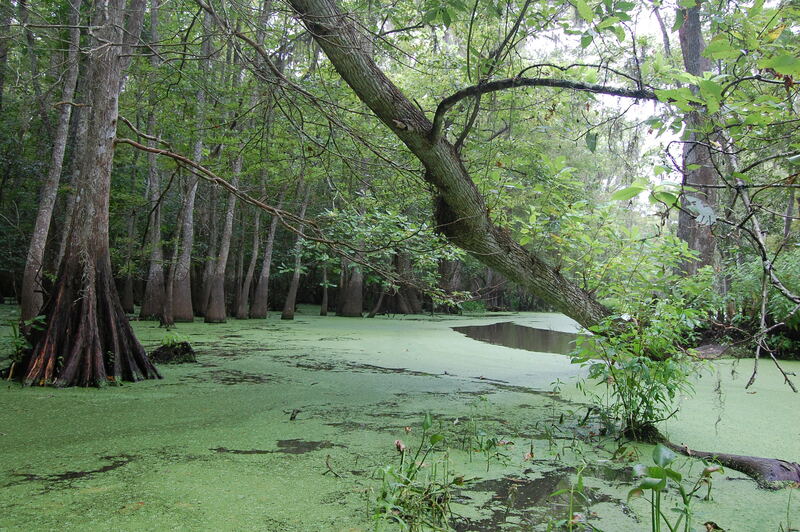 There, the lazy brown water of the bayou met the cypresses at their knees and seeped into the surrounding dim swamps filled with duckweed, gators, and God knows what else. This was the quintessential piece of Louisiana we were looking for. Thunder crackle overhead as we loaded up the canoe with dry bags, firewood, water, and whiskey. As the storm caught up to us, rain peppered the river water and distant wind chimes resonated off the old bridge, adding a metallic eeriness to the air. I climbed to the back of the wobbly canoe and Wesley pushed us off the small boat ramp into the bayou. We looked on as the Volvo disappeared behind the first bend. Thunder, again, grumbled above us. Wesley and I looked skyward and then exchanged uneasy smiles. As the bayou closed in around us, the friendliness and hospitality of Welsh already seemed like a distant memory. The swamp was filled with odd noises, odder smells and all sorts of life forms, little of which you’d want to sleep next to. Giant spiders camouflaged into tree bases and more colorful varieties suspended themselves in the open air above. Some spiders even ran atop the duckweed in the most stagnant areas, diving under the water when our canoe slid past. Most logs floating in the water turned out to just be logs. But when they didn’t, the bottle of bourbon shifting around the bottom of the boat served a more medicinal purpose. And as we continued downstream, I swear the alligators got bigger. As is customary with our canoe trips, Wesley and I got into a fight about paddling. For the record, neither of us actually knows what we’re doing, but we’re both certain we do. And having just seen a movie featuring a canoe chase scene, I was sure I had the edge in this one. “Alright Wes, lets paddle together now, and stroke, and stroke…” Either out of incompetence or spite, likely the mixture, Wesley ignored my instructions and stuck to his own erratic pace. “Damnit Wesley! You’re speeding up on purpose!” I’d yell. He began his rebuttal when, thirty feet away, the water along the shore split with a worrisome violence as something large and black thrashed its way below the surface. That shut us both up. 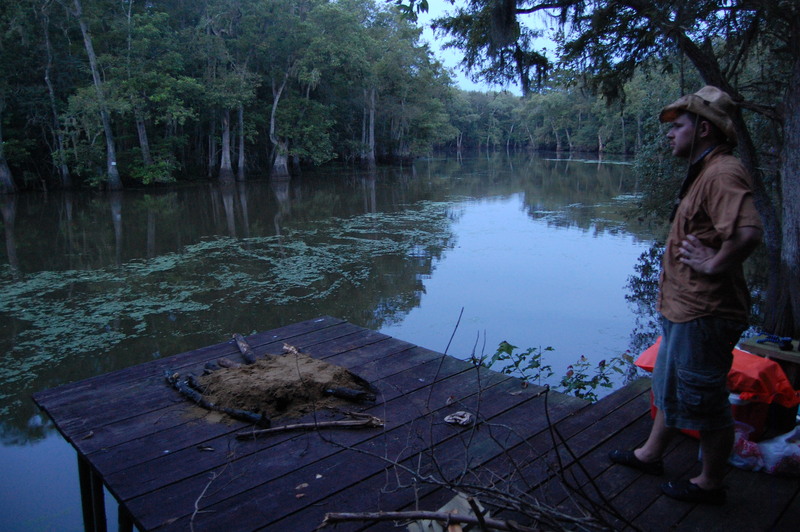 That night we camped on an old fishing dock constructed on a big bend in the bayou. Wesley and I built a fire near a “no trespassing” sign, drank more cheap bourbon and jumped in the canoe for a final excursion at dusk. Using a flashlight, we scanned the swamp for gator eyes. This activity entertained us until we saw how far we had strayed from our dock. Looking back, tiny flames flickered against the wooded backdrop and reflected off the water. The sky above us had faded from a light blue to black and a different set of noises filled the cooling air. Night had fallen on Lacassine Bayou and made us realize just how alone we were. As the feeling sank in, we decided we had had enough alligator encounters for the day. So, Wes and I rowed back through the dark waters to our swamp home. The next day we arrived back at Lorrain Bridge by mid-morning. With an additional coat of sweat, grime, and swamp water on our bodies, we walked towards the restroom and hoped to find showers. A voice interrupted our focused strides. “Glad to see y’all!” A gray haired man exclaimed from his porch. “My wife asked me earlier this morning, ‘have them boys in the canoe come back yet?’ We was start’n to get consoyned.” This was both odd and comforting. Odd because we had never seen these people before in our lives, but comforting because someone was looking out for us. After a day filled with alligators and a night in the swamp, it was good to be back in the company of Cajuns. *The original structure of Lorrain Bridge was built around 1900 and was used as a crossing for cattle drives in the 1940’s. Sometime later, a barge that was a bit too large took out the bridge. It was recently re-constructed and once again joins the two Parishes of Jeff Davis and Calcasieu. Reviewed and Edited by Katie Chassaing.